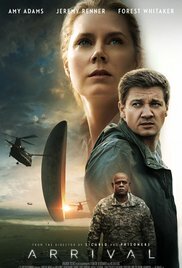 Arrival is about aliens landing on earth simultaneously in several different locations. No one can understand their squiggles which look like wreaths with knobs on them except Amy Adams, more about an academic linguist. We know this because she doesn’t wear much makeup and looks plain. The army gets her to meet these aliens who look like giant octopuses and eventually she figures out that they are trying to tell her that Americans should work with these other countries to figure out their problems and then in 3000 years they will be able to help the aliens. There is a bit of a subplot told in flashbacks and flashforwards with Jeremy Renner being a scientist she meets on the job and with whom she has a child who dies of cancer. With a cumulative rating of 93% on Rotten Tomatoes you’d think it would be better than this. It’s more like the B alien movies of the 1950s.